It's my (The Big Sister) turn to create a challenge for you! can read over and over. Title of Book, Author, Illustrator, and your thoughts on the book. so many books, over and over and over again! Amazing Animal Hide and Seek by John Rowe --I got this book from The Bean! Green Eggs and Ham by Dr. Seuss --We got this book from my Great Gramma Whoo-hoo! The Popcorn Book by Tomie DePaola --its really funny and my sister and me like popcorn so we really like this book!! I love Toot and Puddle so much and it is the kind of book you can read over and over and never get sick of! The Grandmother has a different color nail polish every day. I love the mice and candy. I even had a mouse and beans birthday party when I turned 5 and we had a pinata, rice and beans and a BIG HUGE birthday cake, bigger than the one in the book! I like this book because the pictures are really fun and you can never get sick of the story. I got the book from The Bean when The Little Sister was a baby and the story is hilarious! Abby & Jack & I have read this book one hundred times (and Jack "reads" it to us as well; although he just started kindergarten) The illustrations are abso-lovely AND the story oh-so-sweet... something about the older brother & his 'guidance' with his little sister Lola. She's extremely precocious, but even still, he's sweet to her (however firm when dealing with the library book). The story is immediately appealing & has a sort of cadence within the sibling's banter that is incredibly endearing. The Giving Tree, written and illustrated by Shel Silverstein -- a book with simple illustrations and a simple story line; but that contains such a profound message of absolute and unmovable love. It shows how unattached we become to nature as we grow older, forgetting simple pleasures and living in the now. In the end, the ones who love us most will always be there -- no matter how fast life moves or where the wind blows us. Great challenge Big Sister! It was wonderful to escape my work writing for a moment and to re-read a childhood favorite...sort of my own 'giving tree' moment. I especially love these two books because there message is to just be yourself! Hopefully you can find them at your library. Love this challenge Big Sister! My mom still give me picture books for Christmas and I'm your mom's age. The books saved from my childhood are now some of my children's favorites. One favorite is Beauty and the Beast by Marianna Mayer and illustrated by Mercer Mayer. The story is beautifully written and the illustrations are breathtaking. I think I wanted to live in those pictures - the detail, the emotion, the tear balanced on one perfectly drawn finger - beautiful. This book is now in residence next to Eva's bed and we pour over it together. Another favorite is One Monster After Another written and illustrated by Mercer Mayer. I read this book at least 4 times a week and could read it every day and not get tired of it. Lachlan loves the Wild'n Windy Typhoonigator and Baron always has a "smirk on his snerk" when we read it. Another family favorite is Goodnight Gorilla by Peggy Rathmann. We all take turns making up voices for the page when all the characters say "goodnight". PS - I'm sad to see that the two Mayer books are out of print (also East of the Sun and West of the Moon - another good one)! Check your local library if you are interested. Librarian= Toot and Puddle (Holly Hobbie) These pigs know how to live the good life and still maintain good relationships. Librarian's Husband (who sits in the library reading books to the kids while the Librarian works)= Cloudy with a Chance of Meatballs (Judith Barrett), pre movie. We have an old version from my brother's 3rd grade RIF selection and was sad to read a newer version with very different text (more formal feeling). Librarian's Assistant (3 years old)= An Apple Pie for Dinner (Susan VanHecke). 3 year old mentality is whatever we just read, but it has excellent baked clay and mixed media illustrations. I loved it, Connor loves it. It really helps with any kind of day-even in Australia. All of her books can be read over and over and over again. Funny, simple, concept driven, bright illustrations. And of course I have to count Peggy Parish's "Amelia Bedelia" I laugh out loud every time I see the chicken dressed in his box. I have been reminded that "Skippyjon Jones" is Connor's favorite picture book. The Siamese kitty who thinks he is a Chihuahua goes into his closet and has adventures in old Mexico. Must be read aloud in your best spanish accent. I can not get enough of this book! It's sooo cute! Read it over and over and over!!! Mouse Tales by Arnold Lobel (Author, Illustrator) is a wonderful book with great pictures. Papa Mouse is reading 7 short bedtime stories to his boys. I loved the stories and illustrations as a child, and now enjoy reading them to my son. I could not agree more with Erin's comments above. I believe I've commented on this Silverstein masterpiece in another challenge. I too experience tears every single time. Here's one more (to Tracey's point-I too could go on & on & on)... Chicka Chicka Boom Boom by Bill Martin Jr. & John Archambault (illustrations by Lois Ehlert) is another fave of the A.J./Jack & Ab reading club... It's a particularly rhythmic book & we tend to read it sort of sing-song style with a whole lotta sass. Usually, I read it the first time through & then Jack says "again!" so either he or Ab take a spin through it. Pure delight. Oh, I love all these comments! SO many good books. 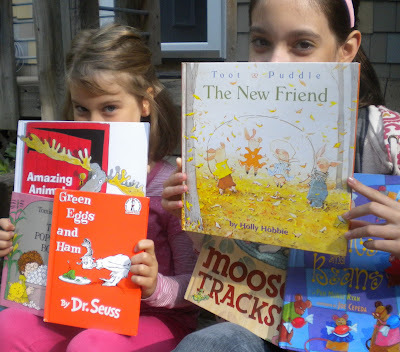 Looking at the picture of the Sisters and the books they picked, I laugh --I remember lines so clearly! Like from Moose Tracks, "there are moose track on my back porch and I'm not sure how they got there..."
And Mice and Beans, "when there's room in heart there's room in the house especially for a mouse!" For an Over and Over Read aloud winner I need good illustrations --I love John Muth and Tomie dePaola. And of course a good story with rich characters and so after many readings they begin to feel like friends. I am sure to add more to this list as I reminisce! Thank you Big Sister for this remarkable challenge! For me, four come to mind: The Clown of God by Tomie dePaulo (given to me years ago by my friend, Joni); the Friend by Sarah Stewart, the Secret Keeper by Kate Coombs and the Quilt Maker’s Journey by Jeff Brumbeau and Gail de Marcken (all wonders from my daughter). The books’ pictures are enthralling (bringing tears of recognition of good & sweetness) as are their incredible stories of being and giving….out of what one is…. PS So happy you like the books I gave you and the Little Sister … next time, I come over, I’d love to reread them with you (and the Mom too)! We have a shelf full of Christmas Books that stay way up there on a tippy top shelf until after Thanksgiving when we take them down and start READING! The Sisters love the way year after year I cry over the same lines... I will never get tired of reading Christmas/Solstice stories this time of year! Maybe we'll read it while were waiting for Wonderstruck! Close your eyes by Jean Marzollo. When my oldest was a toddler, we had to read it every time, she needed a nap or to go to be. Loved, just loved the pictures, and the poetry read so smoothly. I'm pretty sure I could still recite it. 'The Enchanted Wood'-by Ruth Sanderson, amazing illustrations! 'The Weaving of a Dream' by Marilee Heyer- highly recommend. Little B - Cookie's Week by Cindy Ward with illustrations by Tomie dePaola. B never tires of this little cat's curiosity and antics. L - Bats, a National Geographic Reader book. Filled with amazing bat facts, photos, and even bat jokes, this book is a must for any bat enthusiast. My little scientist sometimes keeps this one under his pillow. I did not read very much when I was young, but I LOVED Dr. Seuss!